Bat, Al-Khutm and Al-Ayn consists of a settlement and a necropolis from the 3rd millennium BC. Reasons for inscription are that this area is "the most complete and the best known site of the 3rd Millennium BC" and for its Bronze Age funeral practices. The remains of Bat include 5 towers, houses, tombs and over 100 dry-stone beehive tombs. In addition to Bat archeological site, the designated area also includes two nearby contemporary sites: the tower of Al-Khutm and the group of beehive tombs of Qubur Juhhal at Al-Ayn. 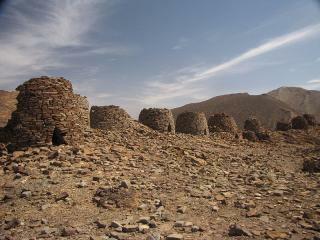 The Archaeological sites of Bat, Al-Khutm and Al-Ayn include a settlement and tombs in northern Oman, dating from the Bronze Age. This area was part of the Magan empire, which supplied raw materials such as copper to the Sumerians (in present-day Iraq). Although getting there has become easier over the years, it still is a nice off-the-beaten-track site seldom touched by non-WH travellers. At 3 pm I hit the road from Nizwa, planning to be at Al-Ayn at the fabled ‘golden hour’ for good photos. I brought print-outs with me of the instructions given on this website to reach the locations of Bat and Al-Ayn. I skipped the even more obscure Al-Khutm in advance. Finding the excavations at Bat proved to be pretty straightforward. I used the approach via Ibri, where the biggest hurdle is avoiding the Pakistani/Bangladeshi men on bicycles riding against the traffic flow. Maps.me, which I used for navigating around Oman, knew a place called ‘Bat. Village. Oman’. This is the modern town, the archaeological site lies just one left turn away right before it. I found the site strictly fenced off, there was no way to get closer to the round structures on the hills or the ruins by the road. Apparently the site is still being excavated, and there seems to be no visitor policy. Earlier reviewers have reported getting behind the fences, but that seems not to be possible anymore. There is so little to see now that it was hardly worth it getting out of the car for. On the right side of the road an intriguing, somewhat larger building is being restored: the square tower Qasr A'Rojoom (castle 1145 on the map in the UNESCO site documentation). Getting to Bat had taken me more time than expected: I arrived at 5.15 pm. From here I had planned to continue directly to Al-Ayn, which lies 25km further along the same unpaved road. I tried it for one km, but did not dare to go on: the ground was sandy and uneven. It would take me at least another hour to get to Al-Ayn, permitted that I would not get stuck. That way I would not be able to make it before sunset at 6.22 pm. So I saw no other option to turn back to the main road via Ibri, and try again for Al-Ayn tomorrow. The next day, after first having visited the entertaining goat market in Nizwa, I was back on track at 9 a.m. Thanks to the very detailed and spot on instructions by Brian Baum, I found the tombs at Al-Ayn easily this time (using the tarmac road exit from the Bahla-Ibri motorway). In true Omani fashion, there’s no sign, no information and no one to bother you. There was a man working his field but he did not blink an eye while I was traipsing through the dry riverbeds and up to the hill. The tombs consist of 'dry' stacked flat stones. There are still piles of the same material lying around it, so perhaps there used to be more. They are in such a good condition that they appear to have been recently rebuilt. Each tomb has one small entrance. It’s a bit hard to look inside, but they seem to be empty. Read more from Paul Duijzings here. Visiting World Heritage sites in Oman can be a frustrating proposition. The roads to the sites are usually not signposted and once you arrive there is little or no information to explain what you are seeing. Searching for these sites on the Internet is also very frustrating, with so much outdated or inaccurate information. I was at Al-Ayn at the end of January 2015, and fortunately I found it a very easy trip for anyone with their own transportation to make. As access to the site is completely unmarked, I took notes on what to look for on the way to and from the site. Hopefully you will find this helpful. Heading on the motorway from Bahla towards Ibri take the exit marked "Amla / Wadi Al-Ain" which is approximately 40 km from the "Bahla" motorway exit. The motorway exit from Ibri is also marked "Amla / Wadi Al-Ain" and is approximately 53 km from the center of Ibri. To get to Al-Ayn from Ibri, follow the directions below from the petrol station. From this stop sign at the exit, make a left and then a quick right just before the petrol station. You'll stay on this road for approximately the next 26 km (to follow these directions, you may wish to zero out your trip odometer at the stop sign). Look at the short dark brown hilltops off to your left after the first few kilometers and you'll see the some of numerous burial mounds that line the road on the way to Al-Ayn. At approximately 14 km you will see the first view of Jebel Misht just as you pass the gold domed mosque on your right. At approximately 24.5 km you will see several large blue directional signs as the main road turns to the left - continue on the main road (in the direction of Sint and Sant) - DO NOT follow the right arrow for Al-Ayn. As you round the bend (at 25 km) you will first see the mounds of Al-Ayn off on a low hill to the left. At 26 km you will see a mosque on your right. Pull into the driveway and then drive to the opposite side of the road to the stone covered parking strip directly across from the mosque. The car will now be pointed in the direction to take you back to the motorway. Once parked, walk to the end of the sidewalk (towards the speed bump) and then down into the dry river bed. You will see an opening between two walls almost directly ahead of you. Continue into this entrance, following the path (staying to your right) until you come to a concrete water channel. Walk to the end of the first section of the channel and then turn left. That path will take you out to a second dry river bed (note the white metal gate to your left as you exit the path). The entrance to Al-Ayn is clearly seen at this point. Back at the car, again reset your trip odometer. Retracing your drive back towards the motorway you will see more tombs in the hills on both sides of the road. At 13 km (at the last speed bump) the road splits off to the right for a shortcut back to the motorway to Ibri. Stay on the main road to head back to Bahla. The petrol station is at 26 km. To get back on the motorway to Bahla, turn right just past the petrol station. In about 1/2 km turn left to go under the motorway, turning left again and drive a short distance to get to the motorway entrance ramp. Please note that Al-Ayn is really only accessible only to the surefooted. The site is built on very steep hills and the ground is covered entirely in loose rocks. I visited Al-Ayn twice during my visit to Oman, once in the late morning and once in the late afternoon, about an hour before sunset. I highly recommend the beautiful golden light of the late afternoon. The site is magnificent and peaceful and you are not likely to share it with many other tourists. During my two visits I only saw two other persons there. There are no services of any kind at the site. “Beauty has an address” is the tourist promotion of Oman, but from my experience when I traveled in beautiful Oman, it was very hard to find address in this country even in GPS navigator or Google map especially in the case of the beautiful archaeological site of Al Ayn which at the end I had to use Google Earth and memorized all route details in order to reach the place. On the expanding four lanes highway to Ibri from Bahla, there was a junction in the middle of desert that has a small petrol station, I turn right to the small paved road with no signpost next to that petrol station and continued on this way, passing many dry rivers and villages until I saw stunning view of Jebel Misht, one of the most impressive mountain in Oman. The surrounding Hajar Mountains were equally picturesque and interestingly show layer of rocks moved by seismic force that if in Europe or in China may already listed by some types of UNESCO program. When I reached the village of Al Ayn, again no sign at all I just presumed by myself, the area was lovely with green gardens with some palm groves, and I started to see the stunning view of a row of magnificent beehive tombs on the high hill behind the village together with unbelievable beautiful Jebel Misht as the background. Again I saw the beehive tombs but there was no way for car to reach the place or tourist information center, something that happened all the time in Oman. I found small unpaved road to someone house across the dry river, at first there should be a hiking route from that house to beehive tomb, but no! that house’s wall blocked all the possible pathway to reach tombs. So I decided to park the car on the dry riverbed and walked on such river until I found the small hiking route to reach the tombs. The size of the beehive tombs was my biggest surprise, these tombs were quite big and they were very well preserved, hard to believe its antiquity of 3000 B.C. I took a lot of photographs hoping to capture their beauty with Jebel Misht. Sadly that there was no any information center to tell the outstanding value of this place, everything seem to be a mystery that why this necropolis be here in the very isolated area of Oman, I had a lot of questions for this site but at the end I really enjoyed Al Ayn, this world heritage site in my opinion, was the most exotic one in Oman and probably one of the most memorable site. I also recommended visiting this “Beauty has no address” in the late afternoon, as the sunset will make Jebel Misht and surroundings including beehive tombs at their best with beautiful and romantic red and pink tones but beware a lot of bugs and insects from the dry river bed. It is essential to have your own transport to visit these sites. We drove from Al Ain (UAE) to Ibri and took the road viaAd Dariz to Bat where we found hilltops dotted with stone tombs. Some were restored, and within a wire fence we found the remains of the Al-Khutm tower. From Bat we continued along a dusty but smooth road for about 25 kms until we reached a paved road which led to Al Ayn.These were quite spectacular, strung out in a long row along a ridge overlooking the wadi. From Al Ayn we returned along the paved road which joined the main highway to Nizwa. Just arrived from Oman, seeing all their World Heritage Sites. It is not so bad with accessibility of Bat - there is a sealed road directly from Ibri via Ad Diriz. On a way from Ad Diriz there are already some marked excavations area (no named but at least there are plates). Just before entering Bat village you should turn left (road to Wadi Al Ayn). Bat archeological sites lies just 800 meters on the left. If you don't find it ask locals for UNESCO sites - the majority of them should know. Some structures extend also on the right side of the road. Total area is partly fenced, marked, graves or I should say structures are partly restored. For Al Ayn which is by far the most spectacular Unesco place in whole Oman, you can use the same road to Wadi Al Ayn - accessable but poor - but it is better to go Al Banah (watch for the signposts) and from there go to Al Ayn towards the road Ibri - Bahla. This road is now completely asphalted. If you enter Al Ayn just watch the hills - you cannot miss the graves. This is a hard site to visit. First you need a guide because their are absolutely no signs to get you there. Next you need a 4 wheel drive as you are driving on dirt roads to get there. The way there is to start at Nishwa and travel towards Al-Ayn. Half way you need to turn left into the dessert on a gravel road with no signs. The only landmarks are a small grocery store and a small mosque at the right side of the road at the junction. No other buildings around them. You pass through a small village and then the road takes you for 25Km into the dessert. There is no sign of civilization for the entire stretch except for electric lines on poles running on the right side of the road the entire way. You know you have arrived when you see chain link fences on your left and right, some small white signs from the Oman Archeological Dept. and when the road dead ends in a power substation. The chain link enclosure on the left are the remains of a circular palace. they do not allow close viewing and so you can only take photographs from a distance. he more interesting site is to the right. You need to back track till where the fence starts and enter from there. there are many mounds of rocks piled up where the beehive tombs were. Some have been partially reconstructed. The real interesting site requires driving the 4 wheel behind the hill to the right. Walking will take over an hour round trip. You come to another chain link fence enclosure where several bee hive tombs have been reconstructed. There is an opening in the fence where you can enter the enclosure. Great site for photographs. I really loved Bat. It is incredibly remote, and isn't by any means a spectacular site, but there aren't too many places on Earth where you can walk around the remains on a 5000 year old settlement. It was also fabulous being the only visitors at the site. Their are some tombs which are in excellent condition, and still resemble beehives, but like the other poster I ask any visitor to take the greatest care on this site. There is a real risk of damage due to theft and inconsiderate use of a 4wd. If you take a vehicle into the site, please stick to the well defined tracks. Oh, and one big plus point is the entry fee - my favourite price.... free. Somewhere which is “world unique” should be worth seeking out! The Lonely Planet "Arab Gulf States" didn’t mention the place however. But it was there on the map which came with our rentacar and we did have a few spare hours after visiting Bahla and Jabreen forts before we had to be back in Nizwa. Unfortunately the route to it seemed to go round 3 quarters of a circle - there was a dirt road to avoid this but our rental agreement had been VERY specific that all insurance was void on dirt roads! When we reached the dirt road locals confirmed that it wasn’t good enough for a saloon. So on to Ibri which is on the main road from the UAR and the border oasis of Buraimi. From there we made our way north to Ad Dariz (turn off just before) and finally another 16kms to the village of Bat. If you try it you will need to keep asking at Ad Dariz as it is not well signed and locals do not seem be aware of what it is that tourists might be going to see. Just before Bat, where the metalled road ends, turn left - ie NOT into the village. After about 1 km you will come across a line of metal fencing on the left and a circular fenced enclosure on the right. This latter contains the structure shown in the picture on the UNESCO web site – the remains of a tower from around 2500BC. You will need to go behind the fence to see the main area of beehive tombs. The fence is a farce since there is a rough road which just goes round the end of it. One must be concerned for the integrity of the site. Although Omani government notices warn that it is an archaeological site and that nothing must be damaged the whole area is open to plunder from locals wanting stones and from 4x4 enthusiasts driving everywhere. The mention of a “Palm Grove” in the UNESCO description gives the wrong impression. This is desert country and the necropolis lies on dry ground over a large area with the remains of “beehive” tombs dotting both the valley and the tops of the surrounding hills. Unfortunately by now it was getting dark. Although I understand that there are at least 2 tombs in a reasonable state of completeness (ie looking like “beehives”!) we only had time to look at some which were in a poorer state of repair. The circular nature of the structure (see photo) was clearly visible however together with the skill involved in interlocking the stones to create the beehive dome. Some 4500 years ago a bronze age people had created a culture of some longevity and complexity of organisation and belief of which these stones were now the only record. The sun set deep red, the dust blew – and we had a 3 hour journey back to Nizwa . We may not have seen a magnificent ruin, well presented for tourists and beautifully restored but it had been a worthwhile excursion to experience these desert remains! Oldest Buildings: 3000 - 2000BC "Most of these tombs are small, single-chambered, round tombs with dry masonry walls dating to the beginning of the 3rd millennium BCE. Others are more elaborate, bigger, multi-chambered tombs from the second half of the 3rdrd millennium BCE" and "The earliest known tower at Bat is the mud-brick Hafit-period structure underneath the Early Umm an-Nar stone tower at Matariya. The latest known tower is probably Kasr al-Rojoom, which can be ceramically dated to the Late Umm an-Nar period (ca. 2200-2000)".